Generally speaking, CAPA is most often a process owned by the quality function within a medical device company. Quality usually holds the keys and makes the determination as to when a CAPA is required. This makes sense, since the quality organization is responsible for your company’s QMS implementation and effectiveness, and CAPAs are a primary indicator of the health of your company’s QMS. Does it make sense for the quality function to unilaterally make decisions as to what does or does not become a CAPA? Probably not. Does the quality organization have visibility into all sources of data and information to make these decisions? I doubt it. Nearly every medical device company I’ve ever worked with, or know about, is missing a “single source of truth” to make informed decisions about what to do and when to do it. Realize that a CAPA is seldom an issue that only impacts the quality function. A CAPA almost always is cross-functional in nature, involving many other groups and functions within your company. A recommended best practice is to establish a cross-functional team to review and discuss issues that may be candidates for a CAPA. Such a team often is called a management review board (MRB) and is comprised of representatives from quality, regulatory, operations, and engineering. An MRB should meet frequently — probably at least weekly — and review issues related to customer feedback, complaints, audits, nonconformances, etc. The MRB then can assess each issue and make determinations as to which should be elevated to a CAPA. Further, your MRB should maintain a list of open issues, establish an agenda for their meetings, and document minutes from the decisions made. The goal of the MRB is to review, assess, evaluate, prevent, correct, and control quality issues. Additionally, remember that a CAPA is a project that will require resources to address — again, an area where cross-functionality is essential. All too often, CAPAs are not treated with equal importance as other initiatives, such as new product development. This is one of the reasons how and why CAPAs linger and are ultimately ineffective. The acronym “CAPA” will not be used in this [guidance] document because the concept of corrective action and preventive action has been incorrectly interpreted to assume that a preventive action is required for every corrective action. This document will discuss the escalation process from different “reactive” sources which will be corrective in nature and other “proactive” sources which will be preventive in nature. The manufacturer is required to account for both types of data sources whether they are of a corrective or preventive nature. I find this profound for one major reason: This guidance was published in 2010, but medical device companies still seem to focus most of their CAPA efforts on correcting issues, rather than preventing them in the first place. I suspect this is more about mindset than overuse of the term “CAPA” — we are more inclined to address known problems than to invest resources in preventing problems. Wooden hits closer to the mark: the reactive mentality and approach is wrong. This way of doing things causes a significant strain on medical device businesses. I get it. We are all doing our best to get medical devices to market. Once we launch these products, we have established processes to gather customer feedback and complaints, identify nonconformances, and audit. We use these downstream processes to help identify problems and then take necessary actions by issuing CAPAs. As a result, this reactive approach is also somewhat understandable. Why? The medical device industry does not have easy access to data to shift this mindset and approach. The methods used to evaluate situations usually are a lagging indicator, rather than a leading indicator. We need to have systems in place to assess and identify issues before they become problems. Simply stated, a CAPA process often is at one extreme or another: overused or underused. Imagine you receive a complaint about one of your medical devices, or maybe you have a nonconformance. Does this singular event warrant issuing a CAPA investigation? It might. However, I’ve seen some companies issue CAPAs for nearly every situation. And before long, there are dozens of CAPAs, in addition to the complaints, nonconformances, and other quality events. Conventional wisdom might indicate that issuing a CAPA will lead to improving an issue. But in reality, CAPA overuse results in more significant challenges. Too many CAPAs strain company resources. CAPAs either linger for months, or they are rushed to completion without properly addressing underlying issues. The other extreme is underuse of the CAPA process, when companies do not use CAPA nearly enough, despite quality events occurring that would warrant such action. Is there a magic number of CAPAs a company should have open? No. any factors influence if and when a CAPA should be issued, but they should be organized within a process to deal with potential systemic issues. From my observations, very little time actually is spent determining a root cause. Rather, the prevailing practice is to more or less restate the problem statement / issue description and capture it as the root cause — which rarely is the case. To correct or prevent a problem, you have to accurately define the root cause, or your efforts are likely to miss the mark. You may take care of the problem in the short term, but without getting to the root, the issue has high potential to happen again. The good news is, there are numerous root cause tools and techniques that, if applied properly, will make a huge improvement to your CAPA process. But deploying root cause requires a bit of discipline, as well as embracing cross-functionality. I’m a big fan of the “5 whys” approach because it is relatively easy to understand and can be quickly implemented. Let me briefly illustrate this technique. Consider a basic issue: the device breaks during use. Note, with “5 whys,” the number of “why” questions is less important than getting to an actionable root cause. Additionally, you may not have appropriately utilized your CAPA process, or you are over using CAPA and not getting things done. Bottom line: CAPA mismanagement is a huge problem and — based on the historical data of FDA inspections and issued 483 observations — fault usually lies with a poor definition of your CAPA process. Jon is a medical device industry veteran with over 19 years of experience. 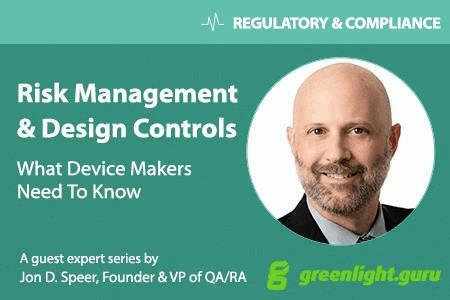 He has helped dozens of devices get to market through a variety of roles, including product development, project management, quality, and regulatory. Jon also is a thought leader, speaker, and regular contributor at numerous leading industry publications.